A perfectly wireless way to connect your Samsung Galaxy Note or Samsung Galaxy tablet with a computer is to use the Kies Air app. Provided that both the tablet and computer can access the same Wi-Fi network, the connection can be made and files can be transferred with relatively little pain. Both your computer and Galaxy tablet must be connected to the same wireless (Wi-Fi) network for the connection to work. Ensure that your tablet is connected to the same Wi-Fi network as your computer. Start the Kies Air app. Kies Air should immediately recognize your Wi-Fi network. It now sits and waits for an incoming request from your computer. On your computer, open the web browser app, such as Internet Explorer, Chrome, or Safari. On your computer, type in the web browser’s address box the URL listed on your tablet’s touchscreen. After typing the URL in your computer’s web browser, you’ll see an Access Request prompt on the tablet. The prompt should state the name of the computer requesting access. In the proper location on the web page shown on your computer, type the PIN listed on the tablet’s touchscreen, and then click the OK button. The tablet and computer are now connected via the Wi-Fi network. A web page appears on the computer in the web browser’s window. That web page is being hosted by your tablet. It allows access to the device’s resources. 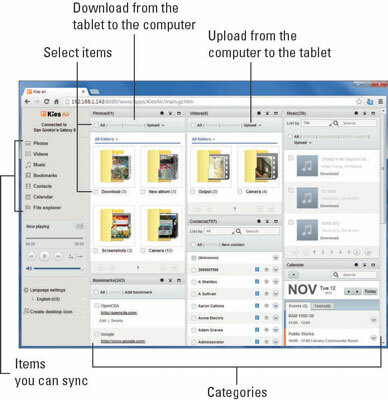 Browse the various categories on the web page to explore files and media on your tablet. To download an item, or copy it from the tablet to your computer, click to select the item and then click the Download link. The item is transferred to your computer just like any file you download from the Internet, although the download comes from your Galaxy Note or Galaxy Tab. To send a file to the tablet, click one of the Upload links. Click the Choose File button and use the Upload dialog box to find a file. Click to select that file, and then click the OK button to send it from the computer to the tablet. To end the Kies Air connection, touch the Stop button on the tablet’s touchscreen. You can then close the web browser window on your computer. While the connection is active, you can quickly switch to the Kies Air app on the tablet by choosing the Kies Air notification. Don’t click the Back button on your computer’s web browser screen when using the Kies Air website. Just use the controls on the web page itself to navigate.